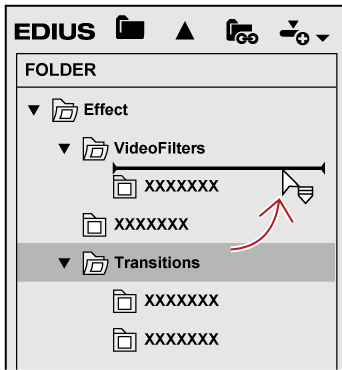 You can sort effects or folders, or change the folder structure. Or you can lock them not to move by mistake. 1) Click [lock] in the [Effect] palette. Each click on [lock] switches the lock on and off. When you select [Back to default], the settings return to the default even after [lock] is enabled. Before making an operation, click [lock] to disable the lock. 1) Drag and drop an effect or folder to the destination.